#DoodQuest2 at Anime Expo! | NIS America, Inc.
Home / Blog / #DoodQuest2 at Anime Expo! Anime Expo starts THIS FRIDAY, dood!!! Are you ready for everything we’ve got in store for you? If you haven’t seen our full lineup of events and guests yet, be sure to check out our latest blog post of events as well as our NIS America AX2016 News page! What fun is Anime Expo without taking on the Dood Quest!? This year, we proudly bring Dood Quest 2: Day of the Red Moon Night. So get your quest on because we’ve got another exciting adventure prepared for all of you! Share this adventure with your friends using #DoodQuest2 on Facebook and/or Twitter, because an adventure is ALWAYS better with friends! A well-seasoned adventurer tells tales of their valiant explorations, and after you embark on your journey to a variety of booths at the Dealer’s Hall to find Prinny’s friends, you will be able to, too! While you’re at it, be sure to check out the goods and merch our friends’ booths have to offer! You may find something you’ve been looking for all this time, dood! A good adventurer never leaves home without a camera to snap all the memorable moments along their quest! This year, we will be showcasing some awesome fan art at the NISA Fan Art Gallery as well as some cool new displays at our own booth! Why not take this chance to snap some memories to alleviate your post-adventure blues when they hit? We’d even love to see what you find, and you can show us easily with #DoodQuest2! Up until now, you’ve only heard and seen the news about our upcoming games, just like spying a new city of intrigue in the far-off distance. Now, at Anime Expo, you will be able to try some of our new games coming out this year! And guess what? One of your quests will be to do just that! Talk about hitting two Prinnies with one stone, eh? Once your journey is over, a special reward awaits! Didn’t think we forgot that now, did you, dood? 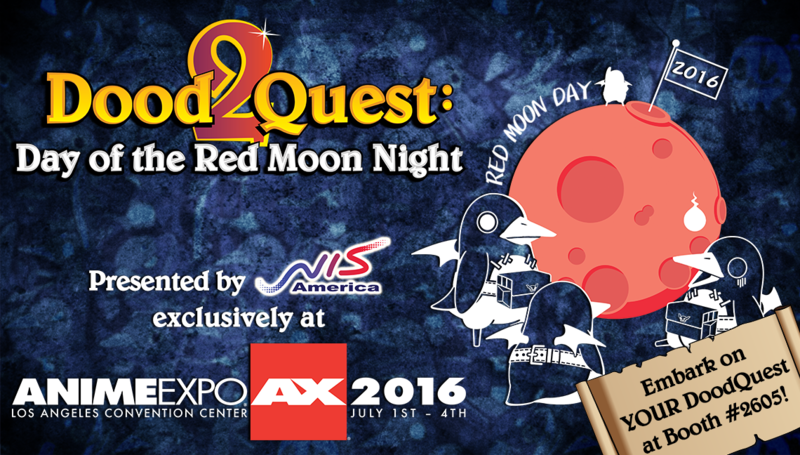 We promise that Dood Quest 2: Day of the Red Moon Night will be an adventure to remember! So get pumped and let us know on social media using #DoodQuest2 which challenges you’re looking forward to! And don’t forget to come on by our booth, say hello to the Prinnies, and embark on YOUR journey this Friday! See you at Anime Expo, dood!